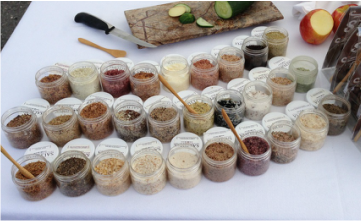 We understand and value the benefit of having our Friends & Family Members sharing their love for SALTOPIA Artisan Infused Sea Salts. This is why we offer multiple ways to sell our brand and earn commissions. How it works: You’ll earn 10% cash of all online sales by simply sharing the url: SALTOPIASalts.com. Then offer your friends/family a secret code for site wide discounts of 10% off all items. With each sale made, you will receive 15% commissions. Please note secret codes are given once you officially become a Friends & Family Member. These codes are randomly updated for privacy reasons; you will be notified if and when we update your current code. Additionally, we cannot refund or issue a commission credit if a customer has "forgotten" or failed to use the code during the check out process. How it works: You’ll earn 10% cash of all catalog sales! Simply pass out our SALTOPIA product catalogs and collect orders! One of our Friends & Family members works as a nurse in the labor and delivery center in a Hospital. She leaves the SALTOPIA catalogs and samples at the nurses station and simply takes orders! If you belong to a social group/club or can share with others at your work place (as long as your boss is "ok" with it, of course), then this is an easy way to share SALTOPIA's product line and earn! What you'll need: You're entire Friends & Family sales kit sampler jars, catalogs, ordering forms and a host who would like to offer this event to their guests. Feel free to host your own guests in your own home as well! How it works: You’ll earn 15% cash for all Tasting Event sales! This is very different from a “hostess party”…it’s a true tasting with multiple rounds of food and education on salts (it’s far more like a wine tasting than a hostess event). We provide you with all the details you will need to host a successful event in the simplest form. Please read more about our tasting events! How it works: If you know of a gourmet ingredients shop, gift shop, seafood market, meat market or other great store front and you feel that SALTOPIA would make a great fit – we offer super competitive wholesale rates with up to 100% mark up for shop owners. We offer commissions for each case sold for as long as they carry our products and you continue to be an active Friends & Family Member! SALTOPIA has already been selling into a bunch of these types of stores for years now and we have excellent success stories. Commissions by case are all unique and listed on the sales commissions chart within your Friends & Family kit. Or you can reprint this here.